NOTE: for accompanying visual illustration see this slide deck. 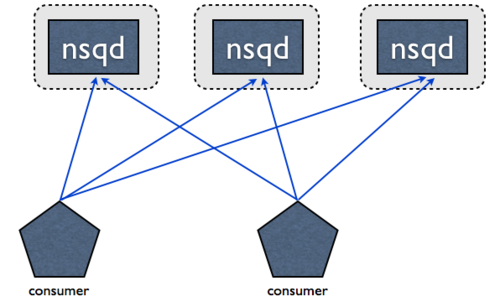 A single nsqd instance is designed to handle multiple streams of data at once. Streams are called “topics” and a topic has 1 or more “channels”. Each channel receives a copy of all the messages for a topic. 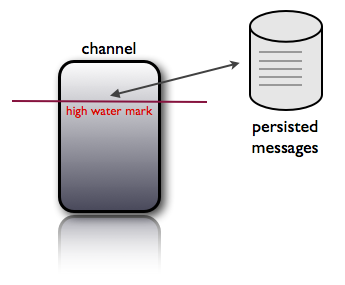 In practice, a channel maps to a downstream service consuming a topic. Topics and channels are not configured a priori. Topics are created on first use by publishing to the named topic or by subscribing to a channel on the named topic. Channels are created on first use by subscribing to the named channel. Topics and channels all buffer data independently of each other, preventing a slow consumer from causing a backlog for other channels (the same applies at the topic level). To summarize, messages are multicast from topic -> channel (every channel receives a copy of all messages for that topic) but evenly distributed from channel -> consumers (each consumer receives a portion of the messages for that channel). NSQ also includes a helper application, nsqlookupd, which provides a directory service where consumers can lookup the addresses of nsqd instances that provide the topics they are interested in subscribing to. In terms of configuration, this decouples the consumers from the producers (they both individually only need to know where to contact common instances of nsqlookupd, never each other), reducing complexity and maintenance. At a lower level each nsqd has a long-lived TCP connection to nsqlookupd over which it periodically pushes its state. This data is used to inform which nsqd addresses nsqlookupd will give to consumers. For consumers, an HTTP /lookup endpoint is exposed for polling. To introduce a new distinct consumer of a topic, simply start up an NSQ client configured with the addresses of your nsqlookupd instances. There are no configuration changes needed to add either new consumers or new publishers, greatly reducing overhead and complexity. NOTE: in future versions, the heuristic nsqlookupd uses to return addresses could be based on depth, number of connected clients, or other “intelligent” strategies. The current implementation is simply all. Ultimately, the goal is to ensure that all producers are being read from such that depth stays near zero. It is important to note that the nsqd and nsqlookupd daemons are designed to operate independently, without communication or coordination between siblings. We also think that it’s really important to have a way to view, introspect, and manage the cluster in aggregate. We built nsqadmin to do this. It provides a web UI to browse the hierarchy of topics/channels/consumers and inspect depth and other key statistics for each layer. Additionally it supports a few administrative commands such as removing and emptying a channel (which is a useful tool when messages in a channel can be safely thrown away in order to bring depth back to 0). This was one of our highest priorities. Our production systems handle a large volume of traffic, all built upon our existing messaging tools, so we needed a way to slowly and methodically upgrade specific parts of our infrastructure with little to no impact. 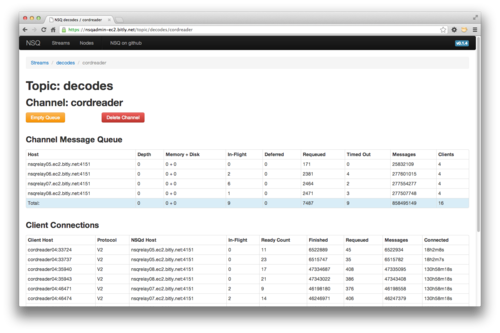 First, on the message producer side we built nsqd to match simplequeue. Specifically, nsqd exposes an HTTP /put endpoint, just like simplequeue, to POST binary data (with the one caveat that the endpoint takes an additional query parameter specifying the “topic”). Services that wanted to switch to start publishing to nsqd only have to make minor code changes. Second, we built libraries in both Python and Go that matched the functionality and idioms we had been accustomed to in our existing libraries. This eased the transition on the message consumer side by limiting the code changes to bootstrapping. All business logic remained the same. This topology eliminates the need to chain single, aggregated, feeds. Instead you consume directly from all producers. Technically, it doesn’t matter which client connects to which NSQ, as long as there are enough clients connected to all producers to satisfy the volume of messages, you’re guaranteed that all will eventually be processed. For nsqlookupd, high availability is achieved by running multiple instances. They don’t communicate directly to each other and data is considered eventually consistent. Consumers poll all of their configured nsqlookupd instances and union the responses. Stale, inaccessible, or otherwise faulty nodes don’t grind the system to a halt. NSQ guarantees that a message will be delivered at least once, though duplicate messages are possible. Consumers should expect this and de-dupe or perform idempotent operations. This ensures that the only edge case that would result in message loss is an unclean shutdown of an nsqd process. In that case, any messages that were in memory (or any buffered writes not flushed to disk) would be lost. If preventing message loss is of the utmost importance, even this edge case can be mitigated. One solution is to stand up redundant nsqd pairs (on separate hosts) that receive copies of the same portion of messages. Because you’ve written your consumers to be idempotent, doing double-time on these messages has no downstream impact and allows the system to endure any single node failure without losing messages. The takeaway is that NSQ provides the building blocks to support a variety of production use cases and configurable degrees of durability. Also, an astute observer might have identified that this is a convenient way to gain an even higher guarantee of delivery by setting this value to something low (like 1 or even 0). The disk-backed queue is designed to survive unclean restarts (although messages might be delivered twice). 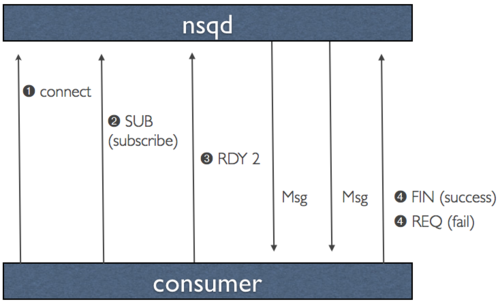 Also, related to message delivery guarantees, clean shutdowns (by sending a nsqd process the TERM signal) safely persist the messages currently in memory, in-flight, deferred, and in various internal buffers. Note, a topic/channel whose name ends in the string #ephemeral will not be buffered to disk and will instead drop messages after passing the mem-queue-size. This enables consumers which do not need message guarantees to subscribe to a channel. These ephemeral channels will also disappear after its last client disconnects. For an ephemeral topic, this implies that at least one channel has been created, consumed, and deleted (typically an ephemeral channel). NSQ was designed to communicate over a “memcached-like” command protocol with simple size-prefixed responses. All message data is kept in the core including metadata like number of attempts, timestamps, etc. This eliminates the copying of data back and forth from server to client, an inherent property of the previous toolchain when re-queueing a message. This also simplifies clients as they no longer need to be responsible for maintaining message state. Also, by reducing configuration complexity, setup and development time is greatly reduced (especially in cases where there are >1 consumers of a topic). For the data protocol, we made a key design decision that maximizes performance and throughput by pushing data to the client instead of waiting for it to pull. This concept, which we call RDY state, is essentially a form of client-side flow control. When a client connects to nsqd and subscribes to a channel it is placed in a RDY state of 0. This means that no messages will be sent to the client. When a client is ready to receive messages it sends a command that updates its RDY state to some # it is prepared to handle, say 100. Without any additional commands, 100 messages will be pushed to the client as they are available (each time decrementing the server-side RDY count for that client). Client libraries are designed to send a command to update RDY count when it reaches ~25% of the configurable max-in-flight setting (and properly account for connections to multiple nsqd instances, dividing appropriately). This is a significant performance knob as some downstream systems are able to more-easily batch process messages and benefit greatly from a higher max-in-flight. Notably, because it is both buffered and push based with the ability to satisfy the need for independent copies of streams (channels), we’ve produced a daemon that behaves like simplequeue and pubsub combined . This is powerful in terms of simplifying the topology of our systems where we would have traditionally maintained the older toolchain discussed above. We made a strategic decision early on to build the NSQ core in Go. We recently blogged about our use of Go at bitly and alluded to this very project - it might be helpful to browse through that post to get an understanding of our thinking with respect to the language. Regarding NSQ, Go channels (not to be confused with NSQ channels) and the language’s built in concurrency features are a perfect fit for the internal workings of nsqd. We leverage buffered channels to manage our in memory message queues and seamlessly write overflow to disk. The standard library makes it easy to write the networking layer and client code. The built in memory and cpu profiling hooks highlight opportunities for optimization and require very little effort to integrate. We also found it really easy to test components in isolation, mock types using interfaces, and iteratively build functionality.